Proudly serving SW Florida since 1988. Take action and beat the heat. Action Cooling & Heating, which has proudly served Southwest Florida since 1988, has everything you need for your home’s cooling and heating systems. We offer sales, service and installation for all brands and models. Our comprehensive HVAC services include: • Central air conditioning • Rooftop units • Duct cleaning • Add-on air conditioning You can count on us throughout the year. Our emergency service is available 24 hours a day. We are fully insured and locally owned. Beat the heat. 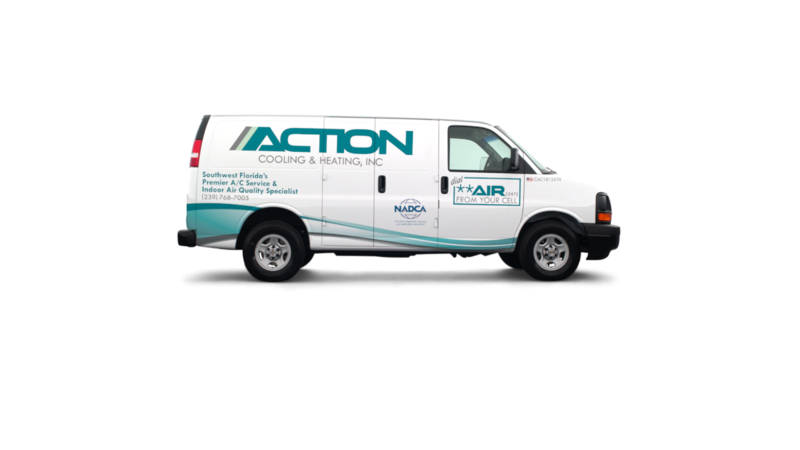 Call Action Cooling and Heating today. Zack did an excellent job. Very friendly and professional was knowledgeable and explained what he found that should be done to protect our unit. Was very pleased with him.